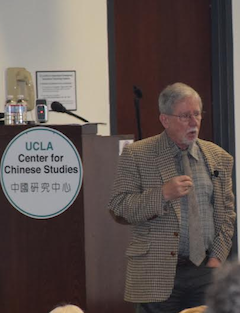 Jonathan Chaves, Professor of Chinese Literature, gave a seminar for colleagues in translation and delivered a public lecture at UCLA. The latter was held at the on-campus Fowler Museum auditorium and attracted some 150+ attendees. It was followed by a book-signing for his books, Every Rock a Universe (on which the lecture was based) and Cloud Gate Song. He also enjoyed an elegant luncheon held for him at the historic Riviera Golf Course by the Lee family, the sponsor of the Lecture series. You can view the videotaped lecture here.